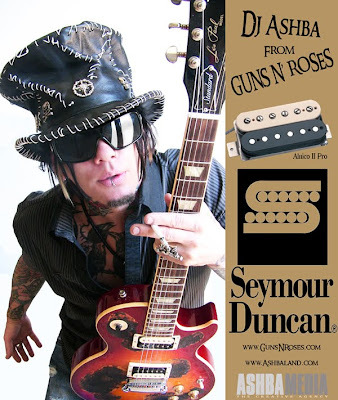 gunsnfnroses: Dj Ashba: "I Hate Bands That Literally Clone Other Bands"
Dj Ashba: "I Hate Bands That Literally Clone Other Bands"
Alison Richter of the Music Industry Examiner recently conducted an interview with guitarist Dj Ashba. A couple of excerpts from the chat follow below. Music Industry Examiner: You were raised in a religious household. Does your faith play a great part in your life? Dj Ashba: It does. I don't go to church every Sunday, just on Christmas, but I still pray every night and thank God for everything I have, because it could all be gone tomorrow. I'm fortunate. I work very hard and I'm very lucky to have two arms, two legs, two hands, and I don't take that for granted. I really could get hit by a car and it would all be over. I thank God every night and it makes me feel good. I'm not a Bible thumper, but at the same time, it was instilled in me at such a young age and it has helped me get through a lot. Music Industry Examiner: When did you become interested in graphic design? Dj Ashba: I had a cartoon in the newspaper for four years when I was young. I was always into painting and drawing, and then I got into Photoshop. Ashbaland is the world of my music and Ashbaland Studio. Ashba Media is my graphic design agency for wallpapers and desktops for mobiles. I love scoring movies, and while we were doing The Heroin Diaries, I knew I could do orchestral music. My mom is a classical piano teacher and I grew up listening to that music. My influences are Danny Elfman and John Williams. I was into film music as a kid, and now I'm getting into making that music. I'm building Ashba Media up with good clients, and my brand with Ashbaland and Ashba Music. Music Industry Examiner: What led you to production work? Dj Ashba: I had done some before SIXX: A.M., but not a whole lot. I always did stuff myself. I think it's super-important to learn the gear you use every day for your business, so every day since I was little I would record a guitar riff in my tape deck and then play along and record that in another deck. It was really crappy, but I was young and learning. Then I got my first 4-track. I always learned the gear, and when Pro Tools came out, I learned that. I didn't know it was classified as producing. I had to learn just to produce what I was writing. Music Industry Examiner: What is the difference between playing guitar and being a guitarist? Dj Ashba: I think the difference is being mature in what you do and in the choices you make. Putting everything into a song and knowing when to go for it and when to pull back. I respect anybody who wants to be any type of musician and I would never discourage anybody. But there are definitely people out there … it's almost like they're into it for the wrong reasons, and that's sad. To be a true guitarist isn't about anything except the art of playing guitar. I didn't get into this … I didn't know I could make money at this. I spent most of my life starving and I didn't care because I loved what I did. Making money now is the icing on the cake. I hate bands that literally clone other bands because they're not original enough to put in the hard work to develop a style. It disgusts me. That's the difference: they don't want to put in the many years of hard work and dedication. They'd rather sit back, rip off somebody else's style and claim it as their own. It makes me cringe. It's embarrassing. The answer to that question — the difference between the two is that being a guitarist means being true to what you do. You can lie to yourself, but others will see through it. Guitar is an art and it takes a lot of years and dedication. It's not an overnight thing. It's a super-long road and you're going to hit the ground, but at the end of the day, what makes you a true guitarist is honing in on a unique style and never giving up. Read the entire interview from Music Industry Examiner.